Manuka honey is a honey with monofloral properties derived from manuka tree nectar in Australia or New Zealand. 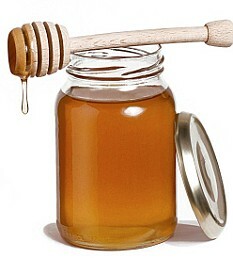 This honey has not been cleared for medicinal use though in vitro it has displayed antibacterial properties. In Australia manuka honey is classified as a therapeutic good and in 2007 the Food and Drug Administration in the United States approved it for wound management. Here will outline the scientific properties that have been discovered about manuka honey. Manuka honey contains several ingredients that allow it to act as an antibiotic. The most prominent of these components is methylglyoxal or MG which is only present in small quantities in other types of honey. In general, the larger the quantities of MG in a substance, the more of an antibiotic effect this substance will have. Manuka honey also contains high concentrations of dihydroxyacetone due to the high concentrations of this chemical found in manuka flowers. The honey is also a source of hydrogen peroxide which can act as an antibiotic. There is a rating system for manuka honey on the market because not all forms of this product contain the same levels of MG. The Unique Manuka Factor or UMF is used to note this property. In order to be considered “active or UMF manuka honey” that will have antibacterial properties, the honey must contain 10 UMF rating or greater. One of the reasons why manuka honey is gaining popularity as a medicinal tool is that no side effects have been associated with its use. Therefore people can take manuka honey alongside antibiotics without the concern that this will lead to health problems. Manuka honey is also significantly less expensive than medications that are prescribed to provide similar treatments for the following diseases. The anti-viral properties of manuka honey can help to eliminate infections stemming from wounds so they can heal more quickly and effectively. Manuka honey has been found to be effective in managing a variety of skin problems including skin ulcers, cracked skin, abscesses, bed sores or acne. Diabetics also claim that manuka honey is effective in managing foot or leg ulcers. Consuming manuka honey can help the body fight off internal infections or diseases including gastritis, sore throat, cold, fever, acid reflux and heartburn among others by boosting the immune system. Consuming manuka honey can help to quell the pain that is caused by conditions such as stomach inflammation, peptic ulcers, indigestion or irritable bowel syndrome. Those that have been vomiting or experiencing diarrhea can consume manuka honey to help rehydrate the body. Pregnant women report that consuming ½ teaspoon ginger juice, a teaspoon of manuka honey and a teaspoon of mint and lime juice 2-3 times a day can help to limit morning sickness symptoms. Recent studies have found that applying manuka honey is an effective way to promote healing and fight infection in leg ulcers and wounds, though some research has indicated that using this product can delay ulcer healing in diabetic patients. The Natural Medicines Comprehensive Database believes that manuka honey could possibly be effective in treating mild burns when paired with traditional dressings. This research has not indicated that they honey is effective in improving the healing of leg ulcers after 12 weeks, even when used alongside compression wraps. Some studies also indicate that manuka honey can be used to address periodontal diseases or gingivitis by lowering plaque buildup of the mouth. It may also improve inflammation of the esophagus that often accompanies chemotherapy. The honey has not been found to increase resistant bacteria growth like some traditional antibiotics which is encouraging for those that would like to use this product for its antibiotic properties. No studies have currently confirmed manuka honey’s abilities to address high cholesterol, diabetes, fungal infections, cancer or balancing bacteria within the gastrointestinal tract. Consuming manuka honey may increase the blood sugar. Some, including those allergic to bees may develop allergic reactions to this product. Additionally, manuka honey may interact negatively with some drugs use for chemotherapy.